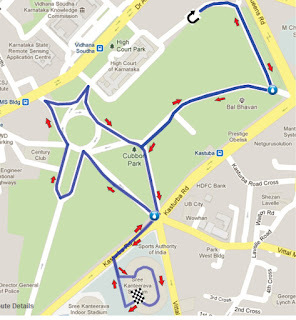 The Contours Women's day run has now become part of the running calendar in Bangalore. The event usually has 10K and 5K runs - this year there were shorter distances too. The first edition was held around the Ulsoor lake in 2010. Last year (which I skipped) was at Clarkes Exotica - a resort on the way to the International airport. 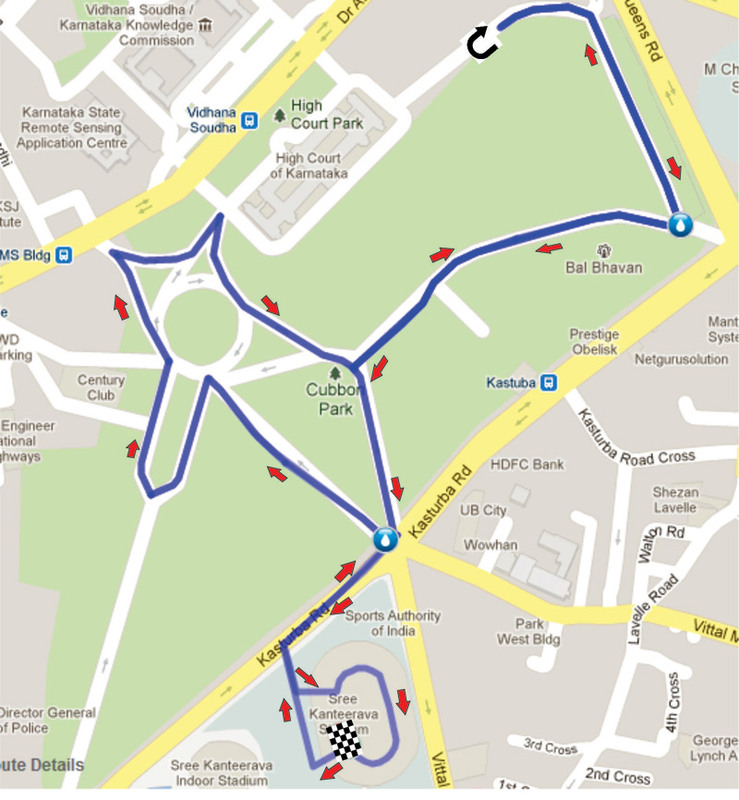 The 3rd edition was held on 4rth March at Kanteerva stadium/Cubbon Park. Being in the middle of my break from running(see previous post) I was not planning to run in this event. However, I still wanted to participate in support of the event as well as the NGOs benefitting from it. Chandra Gopalan the organiser of this event is a good friend and veteran runner passionate about promoting fitness and running in general and among women in particular. I convinced all my family members to participate in the 5Km and registered myself, my wife Asha, son Rahul and daughter Ritika barely a few hours before the registration closed. While Rahul was planning to run 5K the rest of us were going to take a walk in Cubbon Park. Asha,Rahul and myself(Ritika dropped out of the event at the last minute to go on an excursion with some ex-colleagues ) left home around 630am and reached Kanteerva at 7am on 4rth morning. Musical warm up was going on - I spotted Vishy and Ravi with their kids. Pankaj showed up after completing one lap as part of his 10K to do the 5K with his kids. This year's event had over 1200 participants across all categories. The race start just after 715am . Rahul took off at his usual pace trying to squeeze his way through the crowd. Asha and I walked pretty much the entire distance enjoying the nature and fresh air of Cubbon Park. Though I have run here several times - see Cubbon Park weekend - I thoroughly enjoyed the leisurely stroll. I stopped to take several pictures and chatted with a few other walking runners along the way. The route took us past the Sheshadri memorial Central library , KSLTA center and Bal Bhawan . Asha and I completed the walk in about 56 minutes while Rahul took 32 minutes for his run. Met several other runners in the finish area including Naresh and Sridhar from the Chaitanya Samarpan gang.We returned home by 9am after collecting our certificates.